On this week's episode of "Modern Family," Phil attempts to give Jay the best birthday present ever, Luke and Manny try to sneak a few shots of tequila, Cam gets an inheritance from his uncle, and Alex gets accepted by CalTech. It's Jay's birthday, and Phil is determined to give his father in law the best present ever. He gives Jay a state-of-the-art grill as a gift. 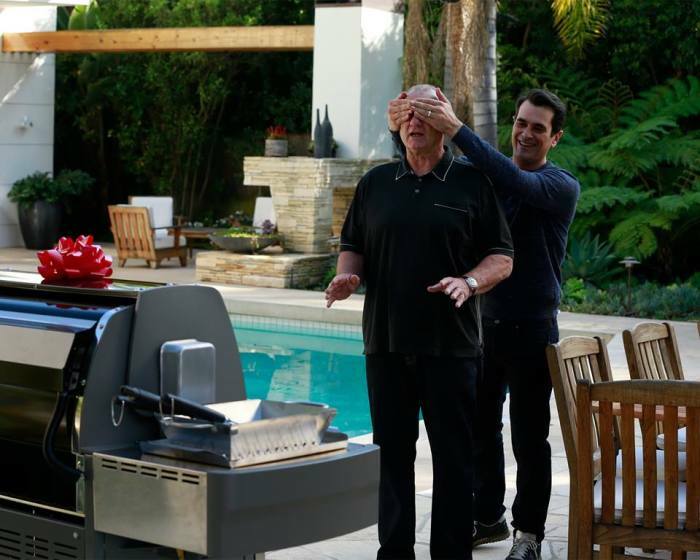 However, Phil's plan to impress Jay backfires when he turns on the rotisserie feature and chicken starts flying off the grill. "Why is this even a setting?!" Phil yells as he uses a pot cover to shield himself from the flying food. Later, as a grand gesture, Phil presents Jay with a check to cover the downpayment that Jay paid on the Dunphy's house, which he never told them. Gloria is trying to catch Luke taking forbidden sips of tequila, so she gets the bottle and fills it up with water. Upon discovering the unattended bottle, Luke and Manny go online to research how to drink tequila. As they're drinking the "tequila," Gloria informs them that they've drunk the worm and that scares the daylights out of them. Later, the boys take an ice bath and Gloria snaps a picture of them, threatening them that if she ever catches them drinking again, she'll send the photo to everyone at their school. Meanwhile, Cam gets an inheritance from his uncle, and Mitchell thinks that it's a good idea to buy the unit upstairs. Cam agrees with him, but in truth, he already spent the money to buy matching fur coats for him and Lily, so he works on a plan to delay buying the house until he has sold the coats. However, he doesn't know that Mitchell already gave the money to Jay to pay him back for buying him a house when he moved out. Alex gets into CalTech, and Claire and Phil are worried that they didn't react well enough as Alex is more standoffish than ever. It turns out that she's scared about going to CalTech and not living up to the expectations of everyone. Alex and Jay have a heart to heart, and he shows her the family fighting in the driveway, Cam in a fur coat, and he tells her the reason why she has to go to CalTech is because "the family needs a leader and I can't do it forever." As they look at the bickering going on, it's clear that Jay thinks that Alex is more than capable of leading the family one day. "Modern Family" airs on Wednesdays at 9 p.m. on ABC.